Welcome to a new year, at PCTE we are looking forward to the new opportunities and knowledge the year will bring and hope that all our associates have a prosperous and busy year. This month's issue we take a look at foundations with articles focussing on Sonic Echo and Impulse Response Testing and a short section on other tests that can be used to confirm the quality and stability of various piles and foundations. Like many areas of the NDT field foundation testing is about identifying the right tests for a particular situation and if need be combining tests in a way such that one result will confirm another. We also have a fantastic Case Study thanks to Ground Probe, be sure to scroll down to the bottom of this email to see SE/IR testing in action in a tricky spot. Sonic Echo & Impulse Response [SE/IR] testing, also known as low strain pile integrity testing is a method of examining the length and integrity of a pile. It can be used with cast or driven piles and involves striking the top surface of the pile with an instrumented hammer to generate an energy wave inside the pile and collecting the vibration response of the pile using geophones or accelerometers. When performing SE/IR it is important to understand the theory behind its operation and to have a clear work method chosen with reference to Australian standard AS 2159. Both Sonic Echo and Impulse Response testing involves the analysis of echoes within the pile, a solid properly seated pile will return a single echo from which can be calculated its depth using the following formula. Where D is the distance, V is the compression wave velocity which will be equal to the speed of sound through the pile material and t is the time taken for the echo to be received after the pile is struck, this is divided by two as the signal must travel the length of the pile and return. Flaws such as bulbs, inclusions and cracking will return one or more echoes as is shown in this diagram, the same formula as above can be used to evaluate depth. Data collected with either Accelerometers or Geophones can be used for Sonic Echo and Impulse Response testing, the difference is in how the data is reviewed and the echoes determined. Where multiple echoes are apparent suggesting either necking or a bulb in the pile the easiest method to distinguish between the two is to review Sonic Echo data. The trick is to examine the direction the plot of the first echo (which will be from the flaw] moves initially, if it moves down this demonstrates a decrease in impedance which corresponds to various forms of necking, inclusions and cracking. An increase in impedance will result in the plot moving up and corresponds to bulbs. SE/IR testing can provide a lot of information about a pile with only limited access. Provided a transducer can be placed on top of or fastened to the side of a pile and the top surface struck nearly any pile's quality can be evaluated at a fraction of the cost that more invasive techniques that require bores to drilled or excavation. No piles are the same. They may differ in length and geometry, material, access, how they were installed, the surrounding material and even the angle. Sonic Echo/Impulse Response (SE/IR) can be challenging on piles that differ greatly from the norm. The following case study examines a very challenging application, which yielded some very successful results and some great insight into how the challenges were overcome. 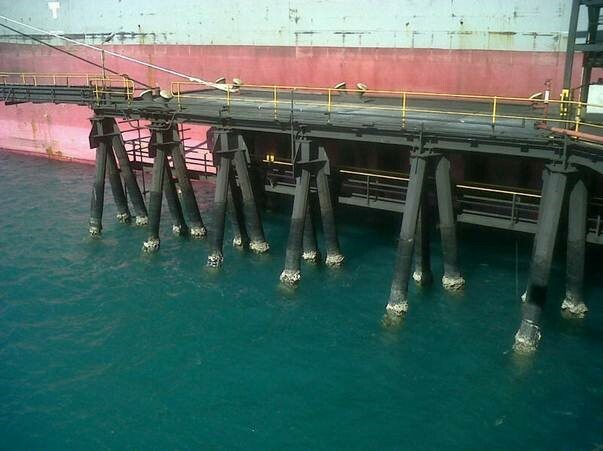 The project was to determine the buried length of piles supporting a wharf at a port facility in Northern Australia. The steel piles are approximately 0.5m in diameter with an octagonal cross section. The piles leave the underside of the jetty with a splayed angle of approximately 15 degrees to vertical. The piles terminate at the top with a steel plate welded horizontally. In some areas the top of the plate was obscured by crossing beams. The piles extend approximately 15m through air, then water and finally into the seabed. The buried portion of the piles was believed to be around 4-5m, however testing was specified to confirm this. The technical difficulties posed by the application can be thought of as three issues. SE/IR relies on the guided p-wave(compression wave) travelling all the way to the end of the pile and back. The longer the pile is the larger the required diameter. This is because the damping on a pile is increased with length and to counter this we need a larger cross sectional area to carry the wave. As a rule of thumb length to diameter ratios of 20-30:1 are considered to be around the maximum recommended geometry for trouble free testing of a pile with most of its length below ground. This of course is a function of the stiffness of the soil. In this case the piles are thought to be around 20m long and hence 40:1 with regards to length to diameter. In addition to this the piles are hollow, increasing the damping effects, as the wave must travel down the skin of the pile. The redeeming factor was that the damping was minimal, with close to 10% of the pile in air, 60% in water and 30% in mud/soil. The damping effects of the air and water should be less than expected in soil. Under ideal circumstances a technician would be able to strike the pile dead centre on the top with the accelerometer and geophone placed nearby. Ideally the surface would be flat and square with the pile. The reason for striking the pile on top in the dead centre is that the waves produced would primarily be p-waves. By striking off centre bending waves are also introduced. Desired wave arrivals at the sensors can be obscured by bending waves making the echo hard to identify. In addition to this most SE/IR systems make use of 1 dimensional sensors. When collecting p-wave data from a pile the sensor needs to be aligned longitudinally with the pile. The access to the piles in question is not ideal. In particular the piles are angled, and the top of the pile was not square with the pile. In addition to this the top of the pile was obscured in many cases. This made data collection a challenging exercise and required a level of ingenuity to allow the project to proceed. In order to allow the sensor to be aligned with the pile a single 1D accelerometer was coupled to a block strapped to the side of the pile. What was more critical was the ability to strike and hence excite the piles longitudinally. A number of methods were tried during a trial period and it was determined that a bracket welded to the piles produced the most favourable results. The bracket on the side of the piles created a ledge with enough space to strike. Welding was required due to the length of the pile and the amount of excitation required. Some bending waves were expected as the strike would still not be centred. Another complication was caused by this solution and that was that the p-waves would travel upwards and downwards from the bracket and hence an echo from the top of the pile was expected in addition to the echo from the end of the pile. Whilst the surround material was expected to provide less damping and hence increase the testable length of the pile, the three media that the pile travels through would pose issues during interpretation of the results. Where the damping of the pile changes significantly (ie air/water interface, water/mud interface) additional echoes would be produced. All up during interpretation the testing company needed to pick the arrival of waves from; the top of the pile, the water line, the mudline and the tip of the pile. In order to eliminate the echoes that were not from the tip of the pile, measurements were required, so as to predict the time at which each of the echoes were expected at the sensor. For instance the sensor distance from the top of the pile, water line and mudline were measured at each pile and later used in analysis. Reflections from some or all of these sources could be present in the data. The overall project was quite successful, however expert analysis was required. In a lot of cases experience with the technique cannot be replaced, this was certainly the case in this project. Sonic Echo was determined to be the best analysis technique for analysis due to its strength in determining lengths and because of the ability to filter out the effects of striking on the side mounted bracket. Below is the time domain data from one of the piles tested during the project. Moving from left to right; we have a large down shift as the pile is struck, the first echo is noted at the water line at around 4000us, followed by the mudline at 11000us and then finally the pile tip at 18800us. To calculate the length of the pile, time from the sensor starting to "listen" to the actual strike is subtracted from the time to the bottom echo (i.e. to calculate the time the wave takes to travel down to the pile tip and back again). This is divided by two and multiplied by the waves estimated speed. A reflection at this time corresponds to a length of approximately 19.9m below the sensor. It is important to note that during analysis and in particular the conversion of time to length a single p-wave velocity is used. This can be estimated by using the measured length of the pile from the sensor to the water line. However this is a simplification of the situation by necessity, in reality the wave speed may change as the damping changes. For instance the water pile section of the pile may have a slightly different wave speed. During analysis an average velocity is used and hence the accuracy of the measurement is a function of this. In this project a wave speed of 4500m/s was used which is substantially lower than the p-wave velocity in steel alone. Overall most of the piles were successfully tested with the results confirming the anecdotal information that was given to the technicians on site. We would like to acknowledge our customer GroundProbe for supplying us with an interesting case study to write about. We would also like to thank Olson instruments for their advice and support. 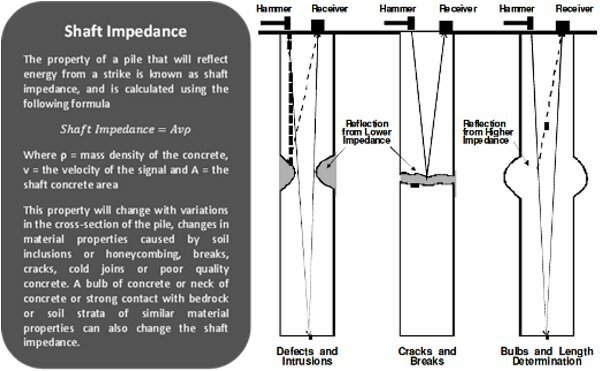 Sonic Echo/Impulse Response is not the only technique that can be used to characterise piles and other foundations. Here is a brief description of some other techniques and where they could be useful. Parallel Seismic is used to determine the length of piles and is useful where access is very difficult. In this technique a water filled tube is bored into the ground near the pile. 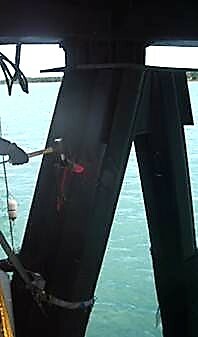 The pile is impacted as a Hydrophone is dropped down the tube. Where the Hydrophone is lower than the tip of the pile a discontinuity appears in the time data. The impact can be on pile caps or other sections of the structure. Cross Hole Sonic Logging is a QA technique for piles or foundations cast insitu. It can be used to determine whether inclusions or other substantial defects are present in the pile. During construction 2 or more tubes are installed into the rebar cage. After the pour the tube are filled with water and Hydrophones are used to measure the p-wave speed between the tubes. Like traditional Ultrasonic where the wave is delayed or attenuated defects are generally present. Ultra seismic can be used on piles or foundations where the access is difficult but a considerable section of one pile (ie a few metres of the side of a pile) is exposed. Ultra seismic uses a string of sensors to map the progress of the waves created in the pile from an impact. By mapping the arrivals the tip of the pile can be determines. It has the advantage that it can be used to determine the dimensions of buried footings underground as well as test piles where access is limited to the side of the pile. Olson instruments' NDE360 is an ideal testing platform for SE/IR testing and is also able to perform a number of other NDT tests such as Impact Echo, SASW testing and UPV testing. The system offers both internal data processing and easy transfer of data files to PC for final processing.